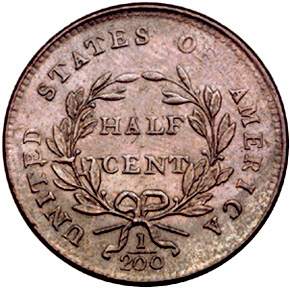 Even though it had a slight head start, the half cent was one of the shortest lived U.S. denominations, running only until February I857, when it was discontinued. In the half cent series, six main design types are recognized. However, as will be seen, it is possible to make further divisions into sub-types, as with the 1795-1797 half cents that come with lettered edges or plain edges. On one die of 1797 the engraver punched the first date numeral, 1, far too high. Then the date was recut in the proper position, resulting in the so-called "l Above 1" variety. Vagaries and inconsistencies in die cutting accounted for several varieties in 1804-1806 without stems on the reverse wreath and with variations in the date numerals. Overdates among early half cents include 1802/0 and 1808/7. In 1809 John Reich's classic head style was adopted. One variety of 1809 has the final digit cut over an inverted 9, the 1809/6 die error. A variety of 1828 half cents has 12 stars instead of the usual 13. The reason for the omission of the 13th star is unexplained (a similar error is the 1832 12-stars $5 gold piece). The Mint stopped producing half cents in 1811 as banks did not want them. The last delivery was on July 9th of that year and consisted of 63,140 coins. However, by 1825, a further demand was sensed, and half cents were struck in that year, 1826, 1828, and 1829. In 1831, Proofs were struck for presentation purposes. Only 2,000 1831-dated business strike half cents were made for circulation, and it is not certain that even this small number saw actual distribution. In the years 1832-1835 a modest coinage was produced annually. After this date the inventory was sufficiently large that no additional pieces were made for circulation until 1849. Proofs were struck in 1836 and from 1840 through 1848. In later years, probably 1858-1860, and again in the 1860s, restrikes were made for collectors. Proof half cents of the 1840s utilize the Braided Hair design by Christian Gobrecht. The same style was utilized from 1849 to 1857 for coins made for circulation, an exception being 1852 which was struck only in Proof. 1793, popular as the only coin of its design type. 1796 with pole and without pole, the latter being the rarer of the two. 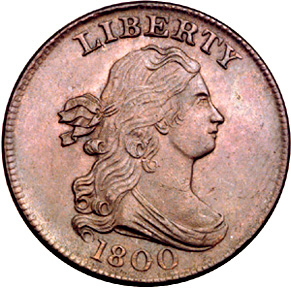 The 1796 without pole is, indeed, one of the classic rarities of the American copper series. Fewer than two dozen are believed to exist, most of which are in lower grades. 1802/0. There are two varieties of this. The first, or "Reverse of 1800," has one leaf at each side of the wreath apex on the reverse, and is exceedingly rare. The second, or "Reverse of 1802,11 has one leaf at the left top and two at the right top, and is rare, but not in a league with the first. The Proof-only issues of 1831, 1836, 1840-1848, 1849 Small Date numerals, and 1852 were made in original and restrike form, and are a special study unto themselves. Each is a major rarity, and in Proof preservation is worth thousands of dollars. Some clever forgeries, mainly electrotypes, exist. As is the case with all rarities, half cents should be certified or expertised. Bowers and Ruddy: United States Half Cents 1793-1857, by Q. David Bowers and James F. Ruddy, New York, 1963. Breen: Walter Breen's Encyclopedia of U.S. Half Cents 1793-1857, by Walter H. Breen, 1984. Cohen: American Half Cents, the "Little Half Sisters," by Roger S. Cohen, Jr., Baltimore, 1971. Crosby: United States Coinage of 1793, Cents and Half Cents, by Sylvester S. Crosby, published in Boston in 1897. Frossard: United States Cents and Half Cents 1793-1847, by Edouard Frossard, Irvington-On-Hudson, New York, 1879. Gilbert: United States Half Cents, by Ebenezer Gilbert, New York, 1916.